I introduce you to Emmett! Our newest little addition arrived in the wee hours on May 29th! I was 37 weeks and four days along in my pregnancy and around 5pm on the 28th I started noticing what I had dismissed for Braxton Hicks most of the day was becoming a frequent, more painful contraction. (I had been experiencing Braxton Hicks contractions on and off for weeks!) After timing my contractions and being in WAY more pain than the Braxton Hicks I told my husband I thought I was in labor. I didn’t want to be the one that went to the hospital and was turned away for false labor so I timed them a bit longer but they only seemed to get closer and stronger. Luckily my sister was over at our house so we packed our other three kids in her car and sent them to grandmas house! When I arrived at the hospital around 6:30pm they hooked me up to all of the machines to monitor the baby and my contractions and started me on an IV because I was pretty dehydrated. Since I was only in my 37th week the doctors wouldn’t do anything to progress the labor such as start Pitocin or break my water. They told us that if for some reason my contractions were to stop and the labor didn’t progress I would be sent home. We understood. When I arrived I was about 3 centimeters dilated and when they checked again later in the evening I was 7-8 centimeters. Since my labor was obviously progressing I was aloud to get an epidural and around 4am the doctor came in and broke my water. She broke my water at 4:15am and I had Emmett at 4:28am (13 minutes later!!). Throughout my pregnancy Mike and I had talked about how we thought he might look. Would he look like Wyatt and Delilah with brown hair and brown eyes or would he look like Mason with blond hair and blue eyes? He came out with light eyebrows, dark hair and it is still hard to tell but I think his eyes are going to be blue. I got to hold him for a few minutes after they cleaned him up and got all of his vitals, but just like with his sister they told us he was grunting and showing signs of respiratory distress. They said I could hold him for a few minutes and then he would have to be taken to the nursery for observation. A few hours later when the nurses came to move us from the labor and delivery room down to our postpartum room they told us they had put him on a nasal cannula because he couldn’t keep his respiratory or oxygen levels up on his own. Later in the morning they told us they had admitted him to the neonatal intensive care unit and would be running tests and doing a chest x-ray. When Delilah had been in the NICU 18 months prior it had been one of the hardest things I ever had to face and now I felt another wave of pain strike through me but I was a bit more prepared this time around. I knew a lot of the nurses already and I trusted them to give my little guy the best care when I couldn’t be by him. After all of the tests they knew something wasn’t right and started him on antibiotics that had to run a five day course. During that time his jaundice levels also spiked and he had to be under UV lights for a few days. I went the first few days without even being able to hold him because they couldn’t keep his respiratory and oxygen levels stable enough. Those were a tough few days. One of the hardest parts was that I planned to breastfeed but I couldn’t hold Emmett let alone breastfeed him. I had to pump every 2-3 hours and I will admit I cried often as I looked down and had little to no milk in the bottles. I just couldn’t seem to get let down and on top of that my milk hadn’t come in yet and I kept beating myself up over it. Finally the day I was discharged (Saturday May 31st) my milk came in and I was able to take plenty for the NICU nurses to feed him and a few days later I got to breastfeed him for the first time. Those were a hard few days! We got to bring him home last Tuesday afternoon (June 3rd) after five days in the NICU. He has been doing perfect ever since! At his first pediatrician visit they said he had lost a little more weight than they would like so we are trying to bulk him up on milk before his recheck appointment on Friday! The past week of adjusting has been hard – I won’t lie. At first Emmett had his days and nights mixed up but I think we finally have that straightened out. It is still hard waking for feeding every few hours and then functioning on all four cylinders the rest of the day. Luckily my husband had saved up quite a bit of vacation time so he has been home with me the whole time. He goes back to work on Friday (fingers crossed I can do it on my own!) The transition has been hardest on our 19 month old Delilah who was already starting to show signs of terrible-twos. She has been throwing tantrums and getting into all sorts of things to get attention. On top of that she is going through a naked phase where one second she is completely dressed and the next she is running around naked. I know I am at an emotional stage right now with all my hormones but she had me crying yesterday. If it wasn’t one thing it was another and mixed with my lack of sleep I just broke down. Nobody said having four kids ages 6 and under would be easy! Check out the Poofy Cheeks Blog Pinterest Board for other craft and recipe ideas! 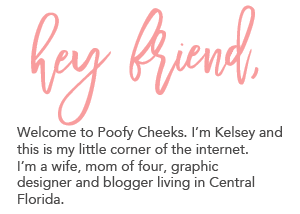 Follow Poofy Cheeks’s board Poofy Cheeks Blog on Pinterest. Congratulations to you as a "Super Mom" and to your beautiful family on welcoming a gorgeous baby! We never know how much love our hearts can hold until a baby comes into our lives. May Emmett be blessed with continued good health as he brings his loving family much joy, love and hapiness! Five day's in NICU must have seemed to be an eternity! We had a new "Little Princess", "Harper" join our family on June 9th and as great aunt and uncle we are so thrilled! Sadly, she was born with "CDH" (which is so worth googling) and will be hospitalized at Boston's Children's Hospital for a minimum of 4 to 5 months! It is so hard for her loving Mom and Dad who have 3 son's and do not live near Boston and have been with their beautiful daughter 24/7! We pray for God to watch over this little angel and give her strength and make her well as he obviously did for sweet Emmett! We ask for prayers and wish you endless joy with your precious son! Wishing you countless smiles every day!